Sometimes we crave small plates and a nice glass of wine or cocktail. Where do we go for that kind of fare, especially when we are feeling lazy and want to stay close to home in Cleveland Heights? One such fun place is Gigi’s on Fairmount. Gigi’s is located in a cluster of local shops on Fairmount between the South Taylor Road and Warrensville Center Road intersections. Steve and I were referred to Gigi’s by our realtor Edie Myhre (at Howard Hanna) when we were shopping for houses last year, so we stopped in for a relaxing lunch while we poured over our listings. Gigi’s is known for their bruschetta boards, which involves a generous order of four different bruschettas of your choosing. Gigi’s also offers a nice assortment of salads and panini sandwiches, of which Steve and I had the former along with the signature bruschetta board. Since our first visit, I have been back twice for dinner with Mom. The selection of bruschettas includes several that are lactose-free, so it’s a great place for Mom to enjoy a small bite with us (Figure 1). We have not yet tried the entrees, but instead have stuck to our bruschetta and salad combo (Figure 2). The cocktails and wines by the glass are both high quality (Figure 3). The mix of fabulous food and whimsical 1920’s French décor make this a fun place to spend a few hours whether it’s the weeknight or weekend. 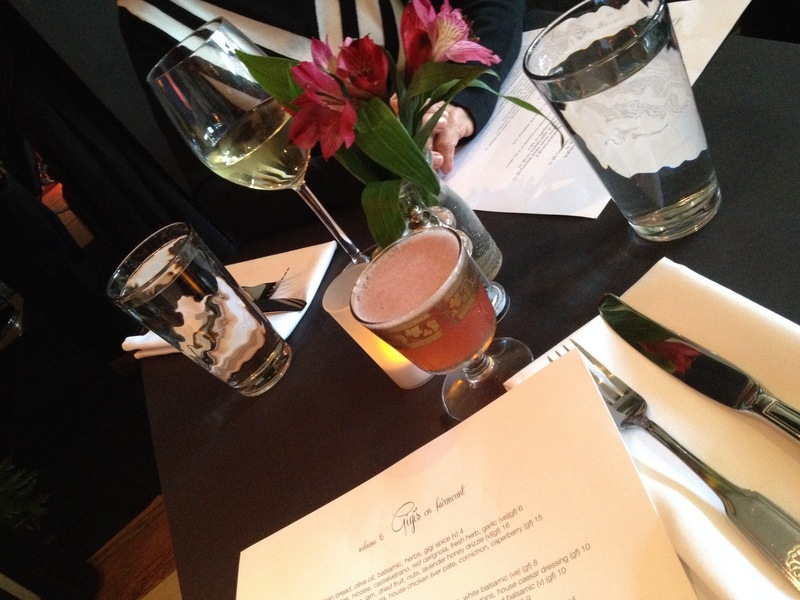 I am sure this little bistro/wine bar will remain a staple in our local dining repertoire for the foreseeable future. Figure 1. A bruschetta board after we dug into it. 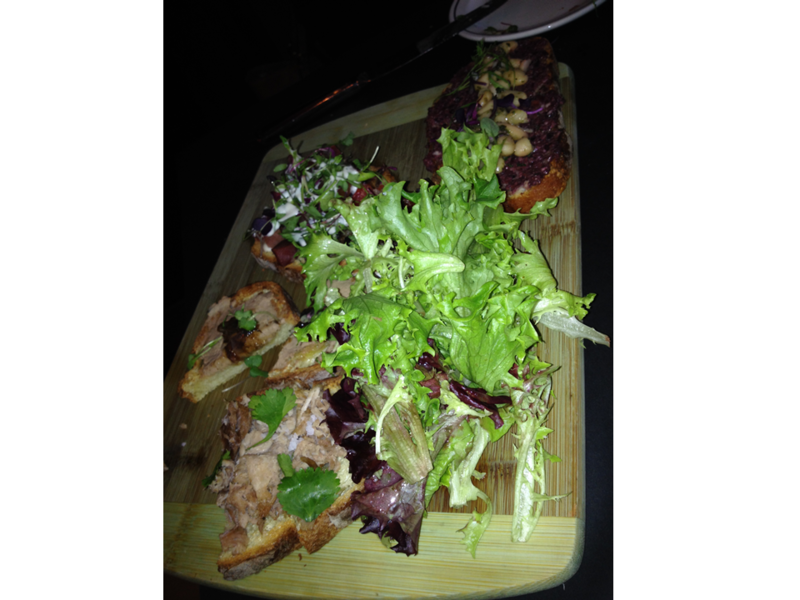 You can still see the remnants of the white bean, kalamata olive tapenade; lardon bacon, micro greens, tomato, house truffle aioli; and roast pork, lime, sea salt, and cilantro bruschettas. Figure 2. 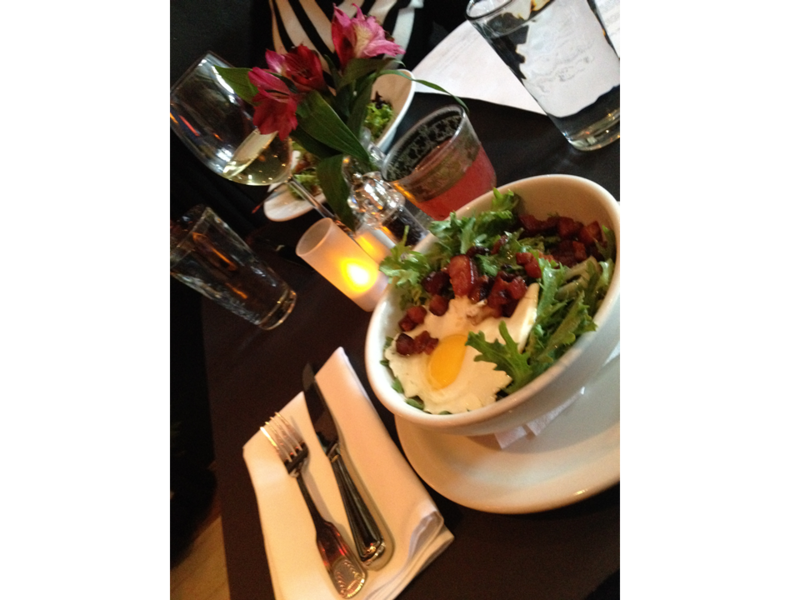 Gigi’s frisee salad (lardon, sherry Dijon vinaigrette, and egg). Figure 3. High quality cocktails and wines by the glass at Gigi’s on Fairmount.